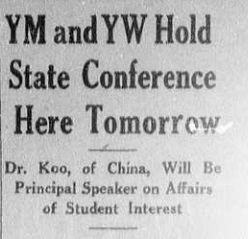 Article "YM and YW Hold State Conference Here Tomorrow"
This article discusses Dr. Koo, of China, as one of the principal speakers on affairs of student interest. Held at the Grace Covenant Presbyterian Church in Richmond, the Young Men's and Women's Associations of Virginia sponsored an inter-racial, statewide student faculty conference. 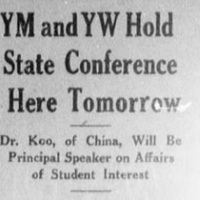 An international figure, prominent for his leadership in young people's work, Dr. Koo was chosen as one of three out of the thirty-four organizations eligible to represent the Chinese people as a whole at the Second Opium Conference called in Switzerland by the League of Nations. As representatives of the conference, all universities and colleges of the state sent delegates, but also invited any member of student body or faculty of any school in Virginia. “Article "YM and YW Hold State Conference Here Tomorrow",” Race & Racism at the University of Richmond, accessed April 18, 2019, https://memory.richmond.edu/items/show/513.